Designed to handle rough terrain, the XR619 is powered by a Deutz 2.9L 74hp Tier IV Final engine. High grip pneumatic 12.00 x 16.5 tires and a ground clearance of 10.8 in. (27.4 cm) make easy work of travelling around an uneven job site. Xtreme Manufacturing's XR619 replaces the Xtreme XR5919 compact telehandler, and becomes the smallest model in the Xtreme telehandler family. Delivering a capacity upgrade over the XR5919, this compact A-Class telehandler has a lift capacity of 6,000 lbs. (2,721 kg), a maximum lift height of 19 ft. (5.79 m) and a forward reach of 11 ft. (3.35 m). 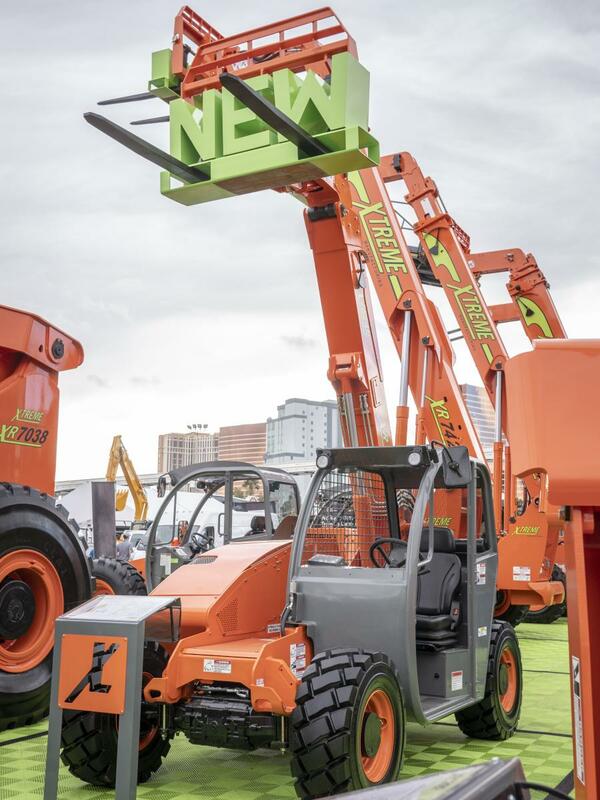 It comes equipped as standard with long-life boom rollers, for smooth, chatter-free operation and minimal maintenance, as well as 360 degree visibility from the cab, intuitive operator controls and a boom lift point. Offered with a choice of three cab configurations — open, enclosed or enclosed with heat and air conditioning — the XR619 can be ordered with either a fixed or a fork positioning carriage, and can be further customized with individual options including LED work lights, a backup camera and synthetic oil for cold environments. Weighing just 10,300 lbs. (4,672 kg)*, the Xtreme XR619 delivers a long working life and low total ownership costs due to an all steel construction. A new cast adapter helps to reduce overall weight, while enabling the increase in lift capacity to 6,000 lbs. (2,721 kg), and new fiberglass engine covers provide improved fit and finish and better accessibility for servicing. For increased familiarity with other Xtreme models, the XR619 shares the same control system as the XR742, XR944, XR1055 and XR1147. Ideal for contractors working on confined construction job sites or in parking lots, the XR619 has a turning radius of just 11 ft. (3.35 m), and compact stowed dimensions of 71 in. (1.8 m) wide and 6 ft. 5 in. (1.9 m) high. It was shown at World of Concrete as a prototype, and is expected to commence production in Q2 2019 at Xtreme's manufacturing facility in Henderson, Nev.
For more information, visit www.xmfg.com.